Most people, except those who may be allergic, love chocolate. I had no idea it had been around as long it has. 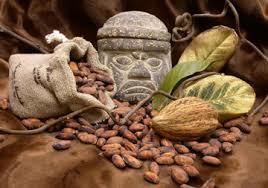 The origin of the word goes back to the Aztec word “xocoatl,” which is a bitter drink brewed from cacao beans. 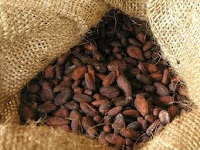 The Latin name for the cacao tree is Theobroma cacao and means “food of the gods.” Chocolate has been around at least 2000 years, but some historians suggest it may be even older. The exact time chocolate was born is hard to pin down, but no doubt about it, it was cherished from the start. Cacao beans were even valuable enough to be used as currency in pre-modern Latin American. One hundred beans could purchase a turkey and a tamale could be had for one bean according to a 16th century Aztec document. 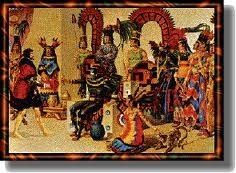 Legends abound around chocolate and one of them is that the Aztec king Montezuma welcomed Cortes, the Spanish explorer, at a banquet where he served a chocolate drink because he mistakenly thought Cortes was a reincarnated deity instead of a conquering invader. Pure chocolate is bitter and didn’t suit the taste buds at first, but after they added honey or cane sugar, chocolate became popular throughout Spain. 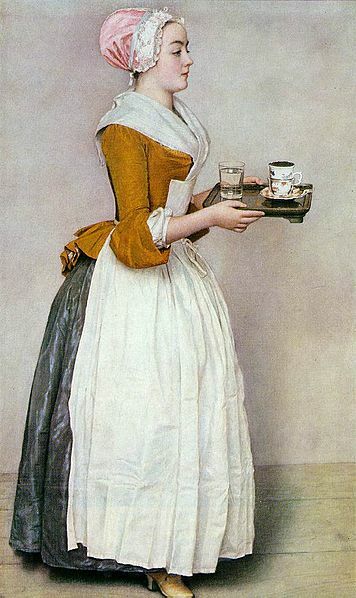 By the 17th century, chocolate had become a popular drink throughout Europe, but only enjoyed as privilege of the rich until mass production became possible in the late 18th century. 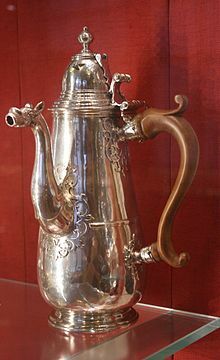 The chocolate drink was served among the rich in a chocolate pot like this one. 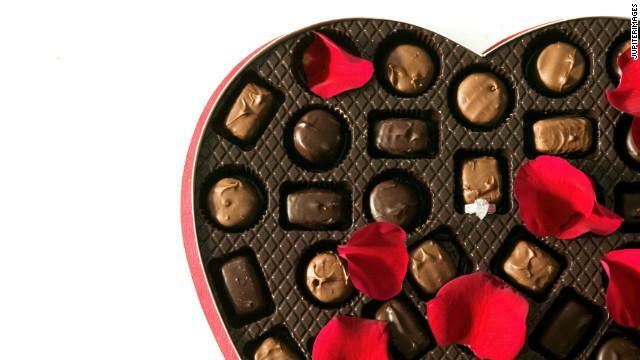 1861: Cadbury created the first heart shaped box of chocolates for Valentine's day. 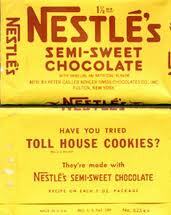 1875: Daniel Peter and Henri Nestle combined chocolate and milk powder to create the first milk chocolate bar. 1879: Rodolphe Lindt produced a chocolate that melts on the tongue with a machine called a Conch that stirs the liquid chocolate to break down any lumps. He called it fondant. 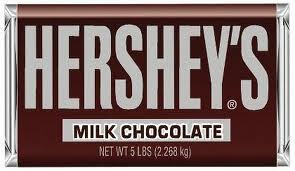 1894: Milton Hershey created his first candy bar and also made baking chocolate, cocoa and chocolate coatings for caramels. 1905 Merger of Anglo-Swiss Milk Company with Henri Nestle to form Nestle's company. All of these are familiar names to chocolate lovers. Whether it’s dark chocolate or milk chocolate is a matter of taste, but dark chocolate may be the best for good health. It contains flavanoids that are good for our health as well as anti-oxidants. A small amount two or three times a week can be good for your heart. In addition, it can increase blood flow to the brain, can help keep blood vessels healthy and helps control blood sugar, contains antioxidants and help free the body of free radicals which cause damage to the cells, contains theobromine which has been shown to harden tooth enamel, and contains minerals like potassium, copper, magnesium and iron. Remember that chocolate does contain fat, so keep track of the calories and the amount. A little goes a long way, especially when it has added sugar. One last thing: Take my money, take my credit cards, but don’t touch my chocolate! If you're a chocolate lover, leave a comment and tell me about your favorite chocolates...brand and type. Are you a dark or milk chocolate lover? Your comment will put your name in a drawing for a chocolate package with your favorites in it. 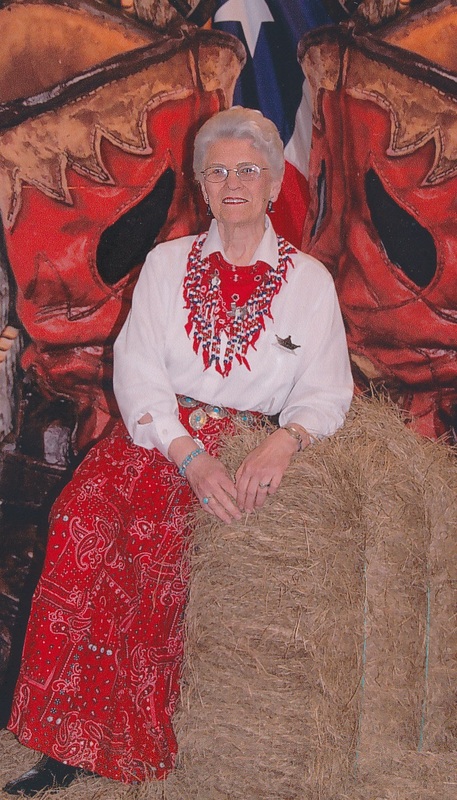 Martha Rogers is a free-lance writer and the author of the Winds Across the Prairie and Seasons of the Heart series as well as the novella, Key to Her Heart in River Walk Christmas and . Christmas at Holly Hill. Martha also writes a weekly devotional for ACFW. Martha and her husband live in Houston. She is a retired teacher and lives in Houston with her husband, Rex where they enjoy spending time with their grandchildren and attending football, baseball, and basketball games when one of the grandchildren is playing or performing. Love chocolate, & loved learning the history of chocolate in your post! I love any kind of chocolate, but have learned to eat dark chocolate, & eat it most often - because of the health benefits. My favorite chocolate filling is peanut butter (I love peanut butter ANYTHING), I also like cherries, coconut, caramel, & flavored creams. Thanks for the opportunity to win one of my favorite things! Wow, the first heart shaped box in 1861!! I assumed that was a recent (mid 1900s) development. I have to admit I will eat any chocolate. My favorite is York Peppermint Patties. I will give up my firstborn for one of those. ;) Dark chocolate is my favorite type. Cream filled chocolates are top of the list also. And I could go on and on and on. If I had to list a few more brands then Reeces Peanut Butter Cups, Milky Way and dark chocolate peanut caramel clusters would be tops - after Yorks, of course. Oh yes. Chocolate. I was extremely sensitive to caffeine for many years and gave up coffee and chocolate for over thirty years. At a 'certain' time in my life, in my fifties, I started to try and eat a tiny bit of it here and there and found that I was now able to tolerate the effects of caffeine! YAY! now I am making up for it. I do love all things chocolate but especially dark chocolate. Last year on a trip to Colonial Williamsburg, we had the hot chocolate at the time - a very strong, almost bitter dark cocoa... and I loved it. It was served at 'coffee' houses as an option and came with the availability of cream and sugar. I trust Colonial Williamsburg for details so it must have been used as a drink in the 1770s in coffee shops that catered to the gentlemen and ladies of the time. my new addiction is dark chocolate covered coffee beans! I need your email address for the drawing. Chocolate in most any form is good! I do love chocolate with peanut butter like the previous commenter! I keep the candy jar filled at work and usually just fill it with Hershey Miniatures. I think my first choice of them would be the Mr. Goodbar! Harry & David makes great chocolate truffles! Oh yes, and I love the H&D chocolate covered cherries. Can eat the whole bag without stopping. Groan. Martha, I love your informative post on chocolate. My mouth is watering as I type. You know, it was once said by Will Rogers, "I never met a man I didn't like". Well, I am here to say, "I have never run across any chocolate I didn't like." I believe that says it all! Thank you for what you do. I'm a milk chocolate lover. I've never cared for dark chocolate. Too strong for my taste buds, I guess. Interesting post, Martha. Do you know when people in the midwest started baking pies and cookies using chocolate? Chocolate was available for stores in the midwest to order in powder (cocoa) or liquid form. Sometime in the early 1880's Lindt put the cocoa butter back into the powder and created a solid bar that could be snapped or broken into pieces that melted in the mouth. It was available so perhaps store owners could order it for their customers. Mr Hershey became fascinated with German chocolate-making machinery on exhibit at the Chicago International Exposition in 1893. He bought the equipment for his Lancaster plant and soon began producing his own chocolate coatings for caramels. Does that help? Very interesting and informative post! I like chocolate, especially milk chocolate (the creamier, the better). Also like milk chocolate with caramel or mint. YUM! But no dark or white chocolate for me! I LOVE, LOVE, LOVE, milk chocolate and I love this post! How interesting to learn the history of this delectable treat!! I have always found dark chocolate too bitter for my taste. However, savoring a piece of milk chocolate is a wonderful thing!! My favorite milk chocolate is Hershey's and Dove. Thank you again for sharing this sweet treat today! My mouth is watering and I might have to raid the pantry for those chips I've been hiding. I love dark chocolate, especially chunks of it in fresh from the oven cookies. But Lindt truffles are a good substitute! Good post, Martha! I love chocolate!! So yummy and it always is a special treat for me. I love the Hershey's nuggets with almonds, Dark chocolate with nuts and Milk chocolate with caramel! Lindt white chocolate bars are scrumptious and Dove Promises help keep the cravings down too! Thanks for all the wonderful history about my favorite type candy. Love, love, love chocolate!! I had no idea it had such a history. Thanks for sharing! I love dark chocolate, but also the sampler boxes. That way I can eat all different kinds of chocolate! Thanks for the chance to win! Thanks for the interesting information on chocolate. I like milk chocolate best, but I won't turn down dark chocolate. I really enjoy truffles. I like the different flavors or just chocolate covered chocolate. My favorite candy bar is Snickers, but that is probably because I tell myself it is more nutritious, since it has peanuts in it! Loved your post on chocolate. I always feel sorry for the people that are allergic to chocolate. I've always loved Hershey's Kisses and M & M's. Milk chocolate has always been my favorite, but dark chocolate taste good. I just love chocolate. Enjoyed the historical information. Thank you for the opportunity to participate in the giveaway. Yes I am for sure a chocoholic. I love milk chocolate but if all thats around is dark, then I will eat it too; I love the Cadsbury choc. candies with caramel inside, like their Easter eggs. Yummy! Also the Dove brand and Hershey brands. Can't think what the other good brands are.I love M&M's,and Snickers. Also Rolos with that good caramel inside. I enjoyed this Martha. Thanks for the give-away.